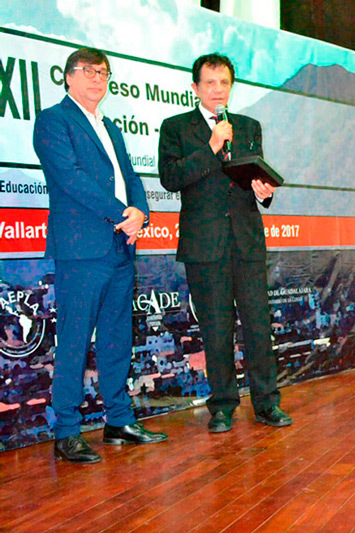 The XII World Congress of Education: "Personalized Education, to ensure Sustainable Development" was held on September 21st and 22nd, 2017, at Centro Universitario de la Costa de la Universidad de Guadalajara, in Puerto Vallarta, Jalisco, Mexico. 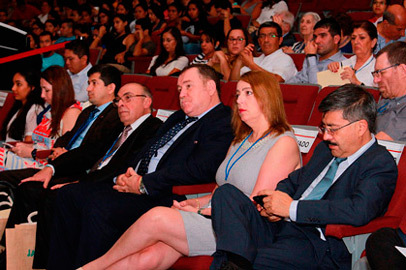 An event attended by distinguished researchers and professors from Latin America and the world. 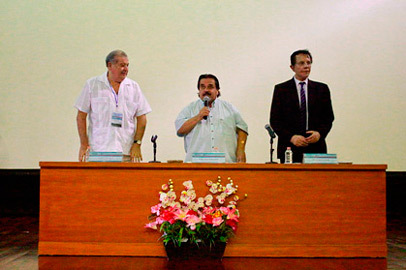 Dr. Alfredo Dachary; Dr. Marco Antonio Cortés Guardado and Prof. Dr. Edgardo N. de Vincenzi, in the Congress Opening Act. 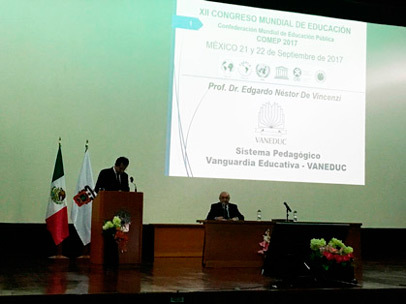 The XII World Congress of Education: "Personalized Education, to ensure Sustainable Development", was organized by the World Confederation of Private Education (COMED); the European Association of Private Education (CADEICE); the University of Guadalajara (Mexico); the Federation of Educational Associations of Private Education of Latina America and the Caribbean (FAEPLA) and the Association of Autonomous Centres of Private Education (ACADE). 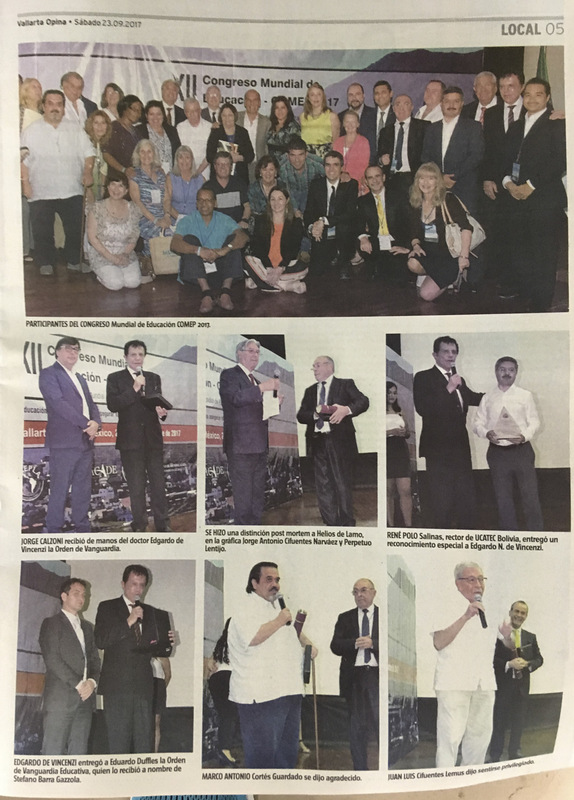 FAEPLA and COMED’s Authorities from all around the world during the Congress Opening Act. 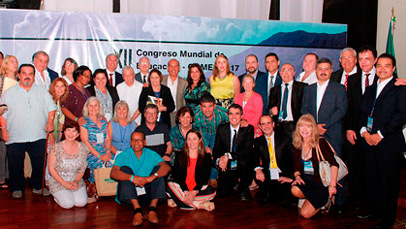 The election of Puerto Vallarta, Mexico, as a destination for this conference, is not an accidental choice, since the World Confederation of Education (COMED) has conducted a number of actions in the field of social development and education, and bring the World Congress to all the regions of the world and especially to that countries who never had the opportunity to host it. 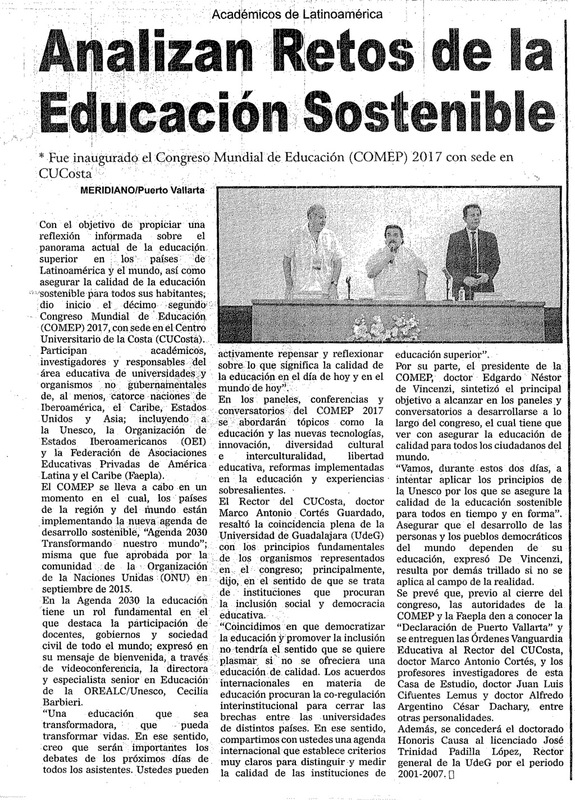 The World Confederation of Private Education (COMED), an NGO with permanent cooperation with UNESCO. Since its origins, it looks forward to develop an education that ensures social inclusion and democratization of education, promotes the pursuit of quality education for all the citizens of the world, through a pedagogical proposal of personalized education. Moreover, has as its motto: "As long as there is in the world, a citizen that DOES NOT accede to a 'QUALITY EDUCATION', that assures their dignities of HUMAN PERSON (food + education + health + work + habitat), OUR TASK will be INCONCLUSIVE”. Speech of Prof. Dr. Edgardo N. De Vincenzi in the Congress Opening Act. 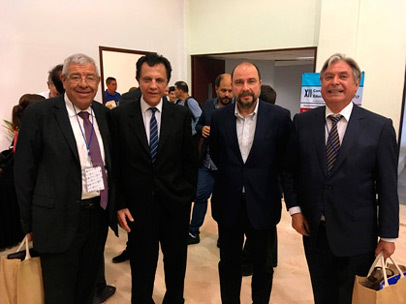 Prof. Dr. Edgardo N. De Vincenzi with CONACEP’s colleagues (Chile). Congress attendees during the plenary sessions. L.E.P. Francisco de Jesús Ayón López - Secretary of Education of Jalisco. 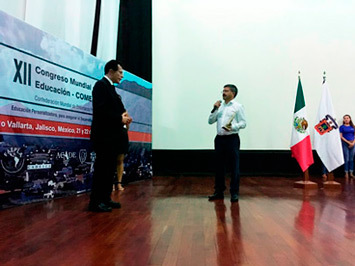 Ministry of Education - Government of Jalisco (Mexico). 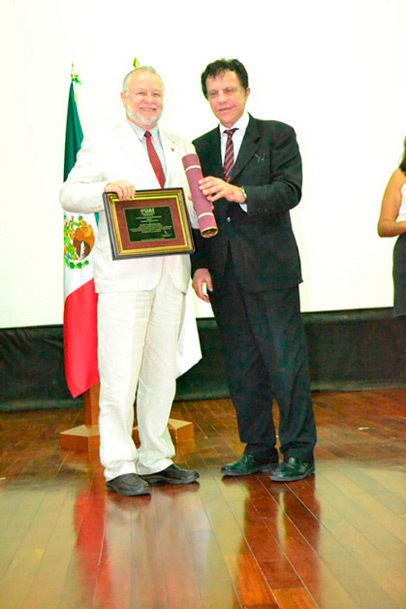 Dr. Mario Antonio Cortés Guardado – Chancellor of Centro Universitario de la Costa of Guadalajara University (Mexico). 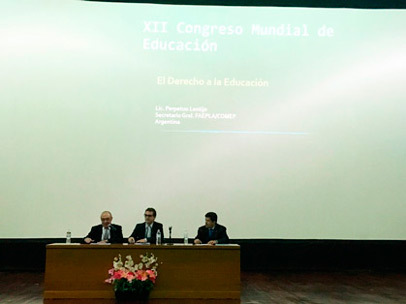 Prof. Dr. Edgardo N. De Vincenzi – President of the World Confederation of Education - (Argentina). Sra. Cecilia Barbieri - Director (A.I) and Senior Education Specialist at OREALC / UNESCO Santiago (Chile). Dr. Alfredo Dachary - Director of the Centre of Studies for Sustainable Tourism Development (CEDESTUR) of the University of Guadalajara (Mexico). Cecilia Barbieri, Director (A.I) and Senior Education Specialist at OREALC / UNESCO Santiago (Chile) in the Congress Opening Act. “Strategies for the professionalization of management teams and teachers. Experiences in different continents. 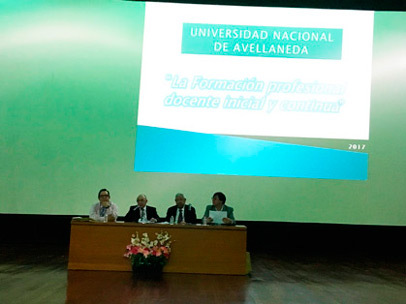 Jorge Calzoni – National University of Avellaneda´s Chancellor – UNDAV -. Member of the National Interuniversity Council -CIN- (Argentina). Francisco Salazar – Director of FAEPLA for CONACEP (Chile). I Made Suastra - Vice Rector of Cooperation and Information, University of Udayana (Indonesia). Susana Mariel Benítez – Minister of Education of the Province of Corrientes (Argentina). Moderator: Perpetuo Lentijo (COMED´s Secretary - Argentina). 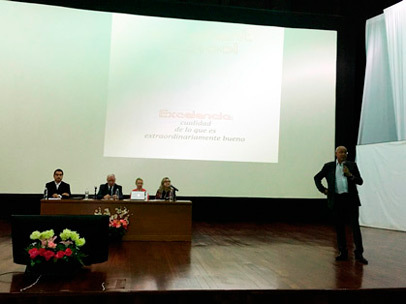 Jorge Calzoni, National University of Avellaneda´s Chancellor – UNDAV -. Member of the National Interuniversity Council -CIN- from Argentina in the First Panel of the Congress. “Education and new technologies. Alternatives to manage innovative processes in the school. The TERCE report of OREALC 13-14. Pedro Henríquez Guajardo –UNESCO-IESALC´s Director (Venezuela). René Polo Salinas – UCATEC´s Chancellor (Bolivia). Néstor Hugo Barallobres – Assistant Secretary of FAEPLA (Argentina). 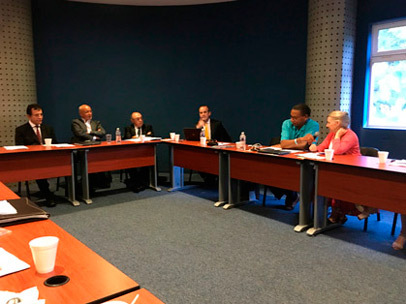 Alfredo A. César Dachary and Stella Maris Arnaiz Burne - Professors’ researchers of the project: “Education and new technologies beyond the pedagogy’s challenge” of the Coast of Jalisco University Center. University of Guadalajara (Mexico). Moderator: Luis Franchi (Treasurer COMED - Argentina). Lecturers in the Debate Sessions. 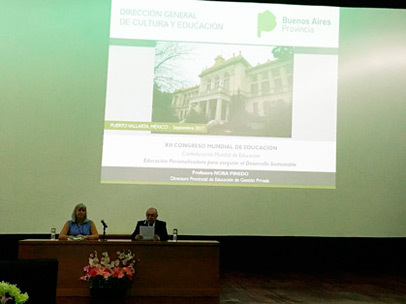 Hernán Herrera Russell – National President of the National Corporation of Private Colleges of Chile CONACEP A.G. (Chile). Nadia Czeraniuk de Schaefer –UNAE´s Chancellor / FAEPLA´s Director (Paraguay). 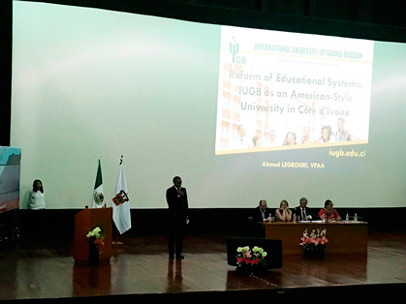 Ahmed Legrouri – Vice President of Academic Relations, Grand-Bassam International University (Ivory Coast). 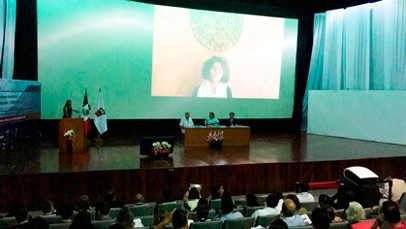 Laura Alicia Aguilar González – Professor of the Coast of Jalisco University Center. University of Guadalajara (Mexico). Moderator: Jorge Antonio Cifuentes Narváez - Vice-President 2nd (Reg. Andina) of FAEPLA (Chile). Ahmed Legrouri from Ivory Coast with other lecturer´s colleagues. Perpetuo Lentijo – Secretary FAEPLA (Argentina). Beytullah Çolak - Director of the Islamic Institute (United States of America). Stefano Barra Gazzola –UNIS´s Chancellor / 3rd Vice-President (MERCOSUR Reg.) Of FAEPLA (Brazil). Moderator: Eduardo Duffles – Marketing`s Director of Educational Group UNIS (Brazil). Lic. 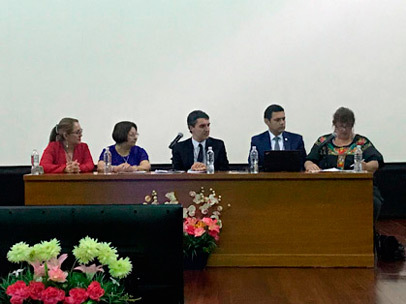 Perpetuo Lentijo, with Brazil and United States colleagues. “Learning Outcomes. Inequalities related to the origin, socio-economic or gender situation of the students”. Lilia Armando – Director of the Liceo Informático Educational Institute (Argentina). Andrés Delich – Director of the Office of Argentina of the OEI - Iberoamerican State Organization - (Argentina). Prof. Kitty Gaona Franco - Universidad Autónoma de Asunción’s Chancellor (Paraguay). José Carlos Cervantes - Professor the Coast of Jalisco University Center. University of Guadalajara (Mexico). 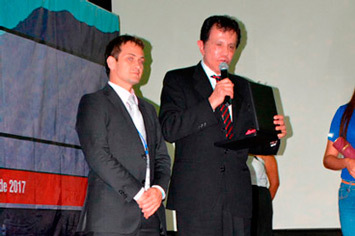 Moderator: René Polo Salinas (UCATEC’s Chancellor - Bolivia). 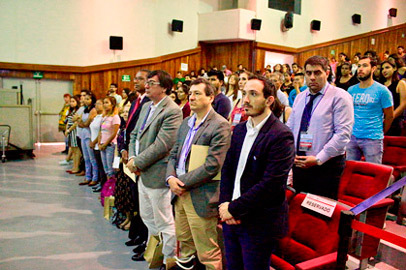 Andrés Delich, Director of the Office of Argentina of the OEI - Iberoamerican State Organization – in the Congress. 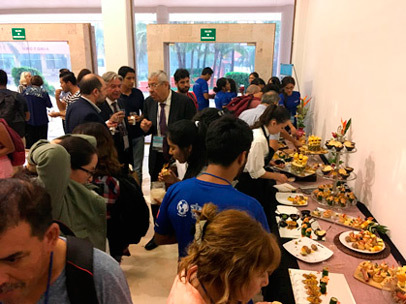 Closing of the panels and invitation and transfer to the Wine of Honor and Mexican antojitos courtesy of the CUC of the University of Guadalajara. Wine of Honor and Mexican antojitos courtesy of the CUC of the University of Guadalajara. Mexican antojitos courtesy of the CUC of the University of Guadalajara. Camaraderie Dinner, courtesy of the CUC of the University of Guadalajara. Marcelo Decoud – Latin America representative for the World Institute for Scientific Exploration (WISE) / Global Project ¨Creer para ver¨ (EEUU / Argentina). 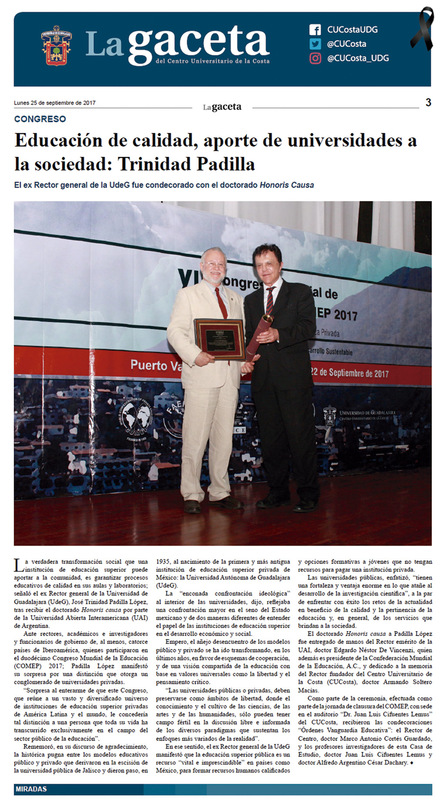 Hugo Alberto Valencia Porras – Fundación Universitaria María Cano´s Chancellor (Colombia). María Inés Fernandez –Colegio Ayelén de La Matanza´s Director (Argentina). Gabriela Scartascini Spadaro - Professor of the Coast of Jalisco University Center. University of Guadalajara (Mexico). Nelly Marín Orozco – Director of Escuela Primo Vargas V (Costa Rica). Moderador: Ezequiel Mateo Martinich – COMED International Cooperation Director (Argentina). Lecturers in the First Debate Sessions in the Second Day. Javier Hernández – Regional Director COMED (Spain). Jane Ann Williams – Executive Director of Global Education at Montclair State University (United States of America). Mtro. Arturo Velázquez Jiménez – Director of the Organization of Ibero-American States (OEI) in Mexico (Mexico). 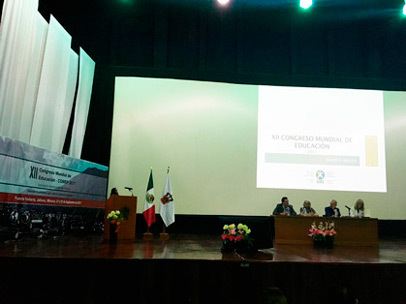 Alicia del Carmen López Preciado – Director General of the Centre for the Development of the University Family of the University of Colima (Mexico). 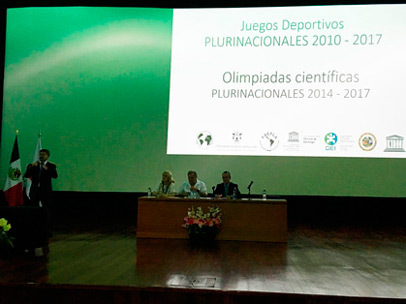 Moderator: Magali Gil Ortega - Principal Director FAEPLA (Venezuela). Javier Hernández, Regional Director of COMED in Spain, with lecturers’ colleagues. Moderator: Perpetuo Lentijo (Secretary FAEPLA - Argentina). Prof. Dr. Edgardo N. de Vincenzi in his Magisterial Conference. 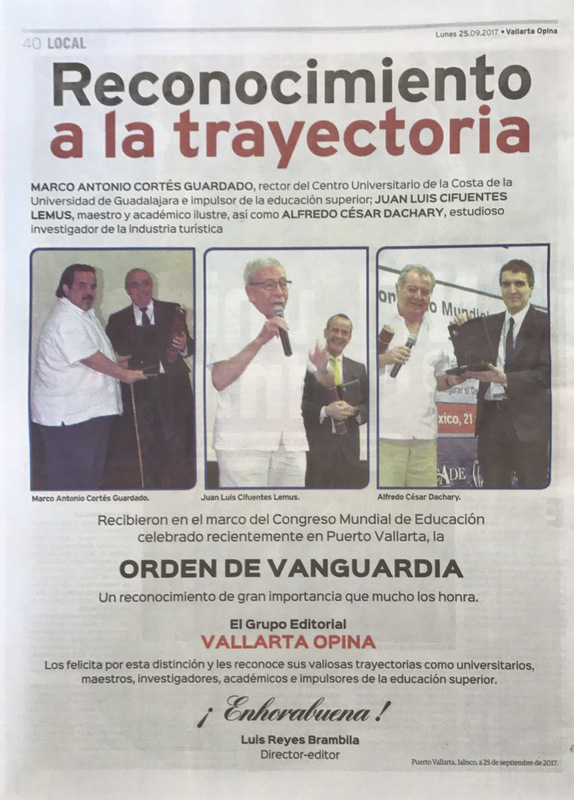 Closing of the presentations and invitation to the act of delivery of Vanguard Educational Orders and Doctorate Honoris Causa. Stefano Barra Gazzola – UNIS´s Chancellor / 3rd Vice-President (MERCOSUR Reg.) Of FAEPLA (Brazil). 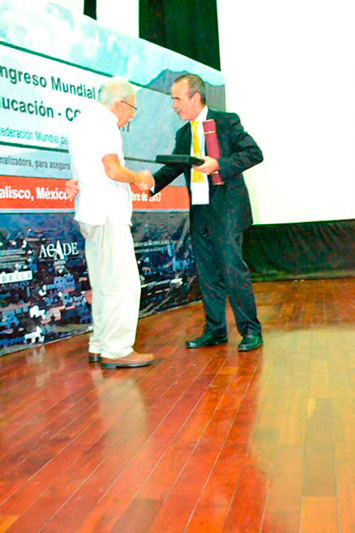 Handing Over: Prof. Dr. Edgardo N. De Vincenzi – President of the World Confederation of Education -COMED- (Argentina). 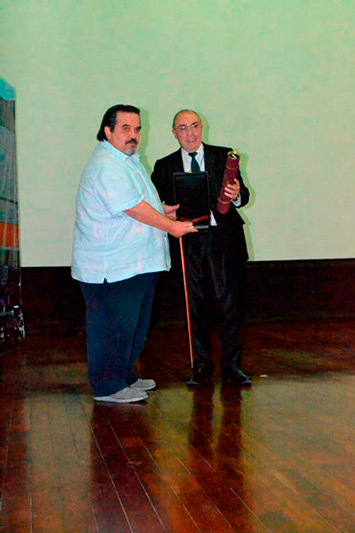 Prof. Edgardo N. De Vincenzi handed over to Eduardo Duffles the Vanguard Educational Order, who received on behalf of Stefano Barra Gazzola. 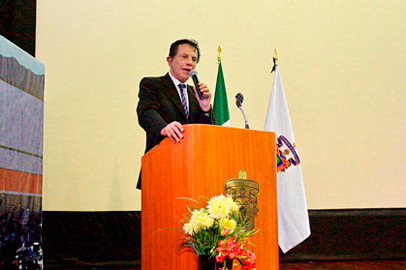 Marco Antonio Cortés Guardado - Centro Universitario de la Costa (2013-2019) de la Universidad de Guadalajara´s Chancellor (México). Handing Over: Perpetuo Lentijo – COMED´s General Secretary (Argentina). 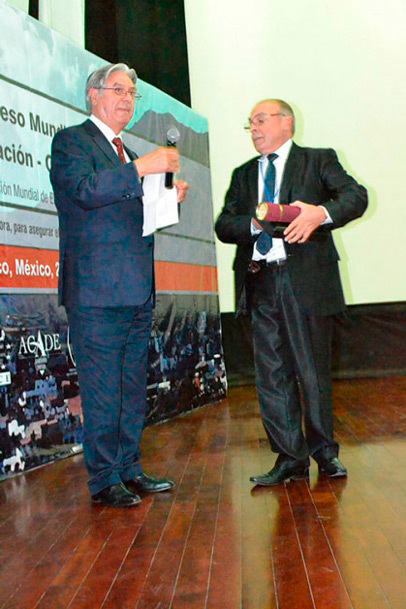 Juan Luis Cifuentes Lemus – Former Director-General of the Fisheries Research and Development Program of the United Nations Development Program and FAO, chapter (Mexico). Handing Over: Luis Franchi – Treasurer COMED (Argentina). Alfredo Argentino César Dachary – Director of the Centre of Studies for Sustainable Tourism Development (CEDESTUR) of the University of Guadalajara (Mexico). Handing Over: Ezequiel Mateo Martinich – COMED Director of International Cooperation (Argentina). 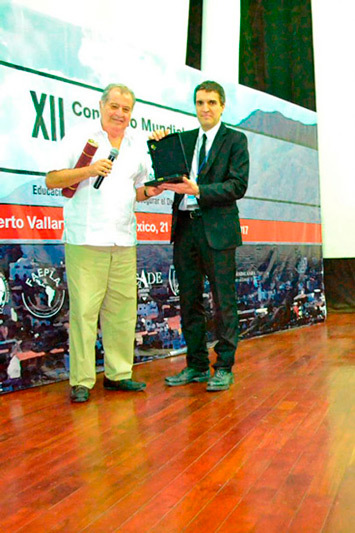 Handing Over: René Polo Salinas – Chancellor of UCATEC and FAEPLA & COMED’s Director (Bolivia). Handing Over: Jorge Antonio Cifuentes Narváez - Vice-President 2nd (Reg. Andina) of FAEPLA (Chile). 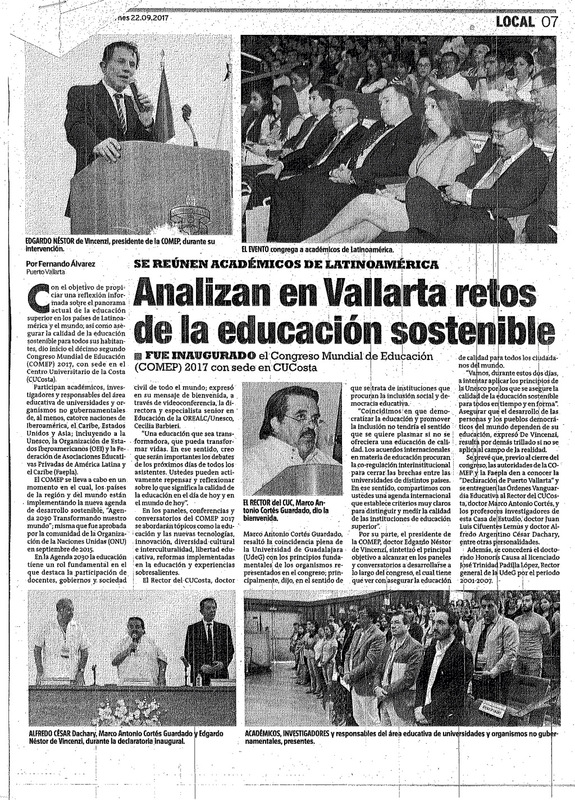 Dr. José Trinidad Padilla López - Rector General of the University of Guadalajara 2001 - 2007 (Mexico). 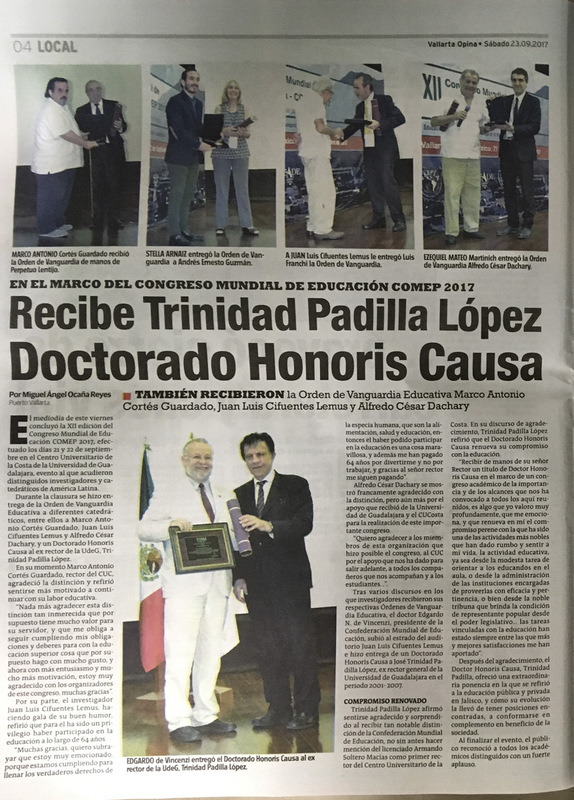 Speech by Dr. José Trinidad Padilla López in thanks to the Doctorate Honoris Causa received. 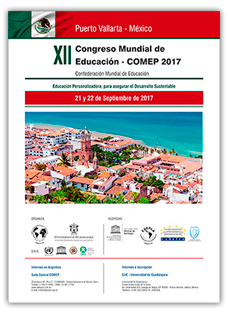 Closing ceremony of the XII WORLD CONGRESS OF EDUCATION - COMED 2017 with words of Prof. Nora Pinedo - Provincial Director of Private Management Education of the Province of Buenos Aires (Argentina) and reading of the Declaration of Puerto Vallarta in charge of Lic. Perpetuo Lentijo - Secretary COMED - (Argentina). COMED and FAEPLA members in the Assembly. Authorities of COMED and FAEPLA. COMED: World Confederation of Private Education. Grupo Educativo UNIS - Brazil. Universidad Alfonso X El Sabio - Spain. 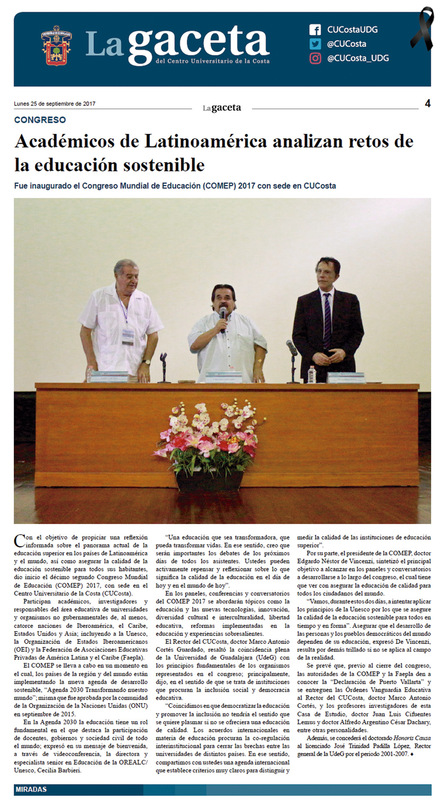 COMED - Confederación Mundial de Educación (World Confederation of Private Education).